WIMBLEDON tournaments bore me to tears. Live World Cup telecasts would have me reaching for the TV remote in double quick time. Being an absolute non-sport enthusiast, I never thought I could find a manga about American football so much fun. Eyeshield 21 is about a first year high school student named Sena Kobayakawa who has the self-esteem of a gnat. Shorter than most kids, Sena has been bullied into being a gopher so often he’s developed phenomenal speeds rushing through corridors and around corners in a panic to please his tormentors. After his childhood friend Mamori Anezaki encourages him to join a club to gain some backbone, Sena chances across fellow schoolmate Ryokan Kurita, the portly but passionate player of American football who ignites Sena’s interest in the game. Although the school’s football team has only two members, an inspired Sena volunteers to be the team manager ? even though he doesn’t know the rules of the game! Unfortunately, the other club member is the notorious Yoichi Hiruma, who forces Sena to be the team’s “secret weapon” after spotting how fast the kid can go. Hilarity ensues as Sena alternates between being the team manager and the mysterious player, codenamed Eyeshield 21, with the golden legs to fly the ball to the finishing line. 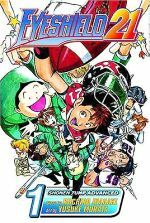 Considering Japan’s somewhat bewildering love for sports-themed manga like Slam Dunk and Prince of Tennis, Eyeshield 21 has unsurprisingly sold over five million copies since it was originally serialised in Japan’s Weekly Shonen Jump publication in 2002. Eyeshield 21 is very kind to the “football-challenged”. The basic rules of the game are explained to readers the same time Sena learns them (right during a critical match!) without cluttering the story with complicated details. The humour comes fast and furious, with the hyper dialogue and art perfectly conveying the energy and excitement of a football game. Each character is drawn with a distinct look although it might have helped if the artist introduced their names to readers. Call me evil, but I like Hiruma, the devilish team captain with the pointed ears and teeth who never fails to drive poor Sena to despair with threats and intimidation ? all for his own good, of course. Vol.1 has 21 bonus pages on the main characters, the Deimon High School, and even quirky glimpses of their bedrooms (Kurita’s has his own refrigerator while Hiruma’s room looks like a dumpsite for football paraphernalia). Plenty of silly, laugh-out-loud moments here. Eyeshield 21 is a pleasant enough read, though perhaps little else for non-sport fans.